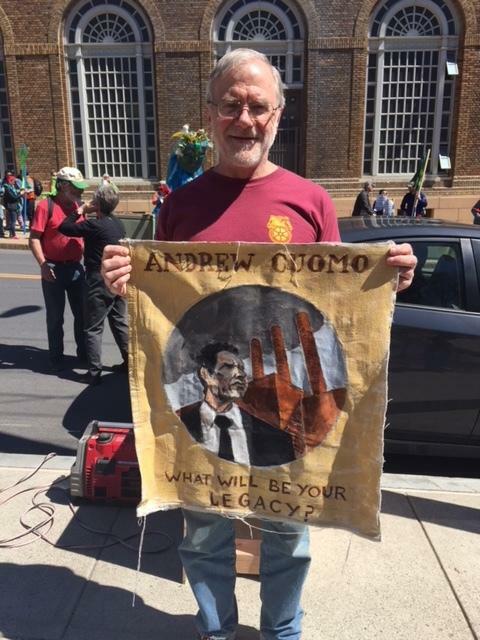 Two of Governor Andrew Cuomo’s political opponents were at an Earth Day rally on climate change attended by hundreds at the State Capitol, where they said the governor’s energy policies are far from adequate. Cuomo’s Democratic Party primary challenger Cynthia Nixon posed for photos with admirers and greeted participants at the rally, which began outside an aging power plant located in one of Albany’s poorest and predominately African-American neighborhoods downwind from the state Capitol. The plant, which used to burn garbage, will now be converted by the Cuomo Administration to natural gas from fracking fields in other states. It would power the numerous state offices located in downtown Albany. Environmentalists and neighborhood residents would like to see the plant converted to non polluting geothermal power instead. Nixon gives Cuomo credit for banning fracking in New York in 2014, saying “it was good first step”, but says it doesn’t go far enough, because it continues to allow power plants and pipelines that rely on fracked gas. “This is not fossil fuel disinvestment by any stretch of the imagination,” Nixon said. Nixon backs a plan, approved in the New York State Assembly, that would completely end the state’s dependence on fossil fuels by 2050. She says she would put more money into wind and solar energy, saying the renewable industry is “begging” for investment. Cuomo’s plan, released a couple of years ago, would cut the use of fossil fuels for electricity in the state in half by 2030, but does not apply those same goals to other carbon emmissions. Both Cuomo and Nixon want the state to uphold the Paris Climate Accord, even though President Trump pulled the US from the agreement. Nixon wore a T shirt that advocates closing a Hudson Valley power plant that runs on fracked gas, operated by the company Competitive Power Ventures. The company’s senior vice president, Peter Galbraith Kelley, was a codefendant in the bribery trial and conviction of Cuomo’s former closest aide, Joe Percoco. Percoco was convicted of soliciting bribes to help get the plant built. She was not the only candidate for governor at the rally, which was entitled “Cuomo Walk the Talk on Climate Change”. Green Party candidate Howie Hawkins began his efforts to change energy policies at protests against the Seabrook Nuclear Power Plant in New Hampshire in 1977. Hawkins and the Green Party want to end reliance on fossil fuels 20 years earlier than Nixon does, by 2030. The protesters marched to the Capitol, where Cuomo was in his office. The governor did not address the protesters, who marched to the Capitol. His campaign issued a statement saying, in part, that “the Governor has led the nation in combating climate change”, including, closing down the “dangerous” Indian Point nuclear power plant and implementing the first multi-state cap and trade system to lower carbon pollution. As a sit- in was held outside his offices, the governor proposed a bill banning the use of plastic bags in grocery stores, beginning in 2019. In 2017, Cuomo signed a bill that prohibited New York City from banning the shopping bags.